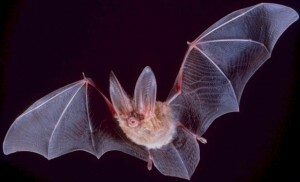 The Townsend Big-Eared Bat is a species of concern that is being protected at the Kentucky Mine. These agile fliers venture out to forage only after dark, using their keen echolocation to hunt moths and other insects. In the spring and summer, females form maternity colonies in mines, caves, or buildings, while males roost individually.